Chad Hendrix, the founder of the Fort Myers Pink Pistols chapter, practices his aim. It's been a year since 49 people were shot and killed at Pulse, a gay nightclub in Orlando. Since then, local chapters of a gay gun advocacy group have popped up around the country, including in Fort Myers. 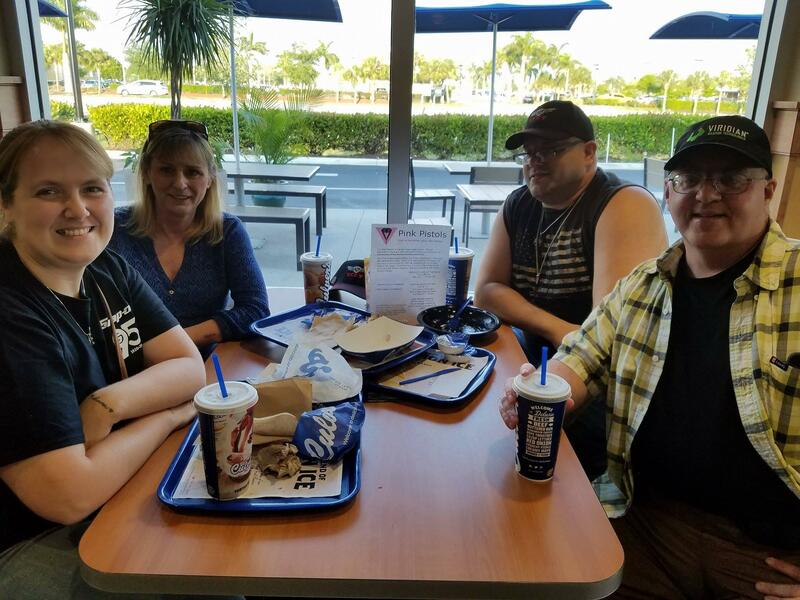 On the second Tuesday of each month, you'll find a sign on a table in a local Culver's Restaurant that indicates you're at the Fort Myers chapter of the Pink Pistols meeting. It's a nationwide organization that encourages the LGBTQ community to defend itself with firearms. The emblem is an upside down pink triangle with a figure holding a gun. Chad Hendrix, who's gay, was at the Pulse nightclub a week before the massacre. When he heard the news, he said he was angry. "Had there been people in there who were armed in there, it's very likely that [Omar Mateen] would've been shot down like the dog that he was," Hendrix said. It's a civil and human right to be armed, he said. And that's why he started this chapter of the Pink Pistols here in Fort Myers. Charlie Bingham, who's a new member, sat next to Hendrix in the restaurant. He recalled how he first found out about the group. "One day, I was singing karaoke in a bar and I went into the bathroom and there was a Pink Pistols ad there and I thought 'okay. That takes a little stress out for me,'" Bingham said. "Maybe it's my own bias, but I was like 'I'd rather learn from a gay guy than a straight guy. It will be easier for me.' And that was the hook for me, somehow." Bingham identifies with the LGBTQ community but said he's married to a woman and has a daughter. But that's the thing, said Hendrix, you don't need to be LGBTQ to be in the group. "Like we say on our flyer: we're a single issue organization. We don't keep any databases," he said. "If you're not comfortable coming out, being out, that's okay. We don't need to know that information." Bingham said he became interested in guns after he became a family man. "It makes me feel like a more responsible parent and citizen," Bingham said. "This is something a citizen should know how to do." Debbie Patterson sat across the table from Hendrix and Bingham. She's straight, but said she's pro-LGBTQ and pro-gun. Patterson said she grew up in the country and the men in her family used guns to shoot wild animals. But she was never taught. "When you see all the crime that is going on and being a single woman, you need protection," she said. Patterson said when she heard what happened at Pulse, she was "horrified. Just horrified." "The first thing I did was make sure [Hendrix] wasn't there," she said, tearing up. "I was at work that weekend," Hendrix said. "It's just terrible that the world has come to this," Patterson said. "Those people in that club should've had the right to defend themselves." Hendrix said Florida gun laws are partially to blame for people being defenseless at Pulse. 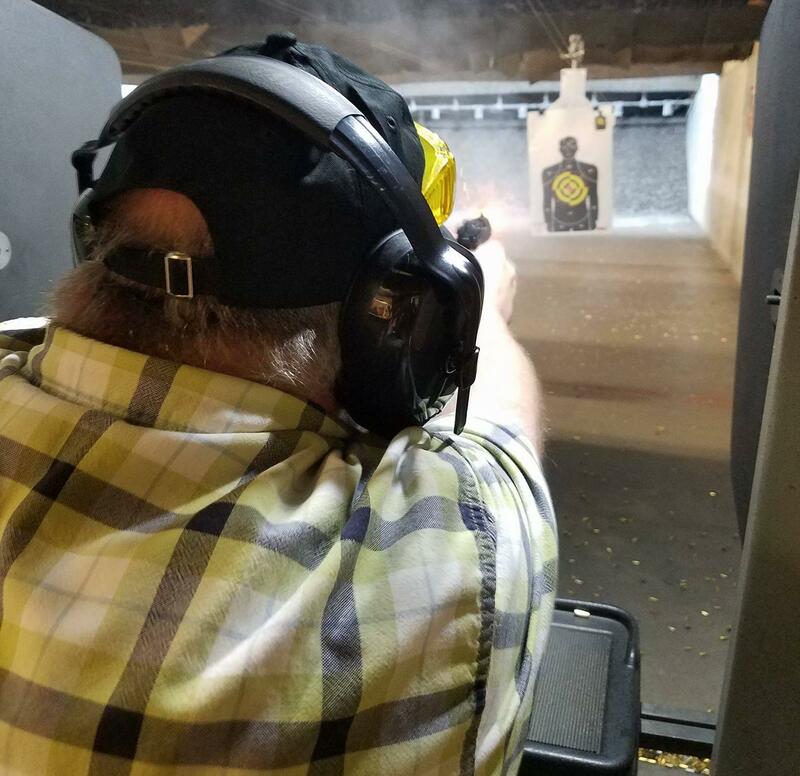 If only Florida allowed concealed carry-permit holders to bring guns into places that serve alcohol, he said. Other states like Tennessee, where Hendrix lived before, allow it. You just cant' drink. And, Hendrix said it works. "We have designated drivers and designated shooters," he said. "That way, everybody's protected." But for Pink Pistols meetings, Hendrix chose Culver's because they don't serve alcohol. Because after dinner, the group goes to a shooting range. Hendrix starts me off on a Walther P22. It's a .22-caliber semi-automatic pistol. There's no recoil, but it gives a sense for how to hold a gun. Then, he gave advice on how to get a better shot. "This is what I call the fundamentals of your grip, your stance and your presentation," Hendrix said. "You gotta put them all together to get those accurate hits." The grip is your hand placement on the gun, your stance is almost how you'd bend your knees to swing a baseball bat and your presentation is more psychological. I kinda procured a shoulders down, chest out mentality. Then Hendrix whipped out a .40-caliber Glock with a laser pointer. It's what he usually carries. It's what he would've carried if he were in an alternate universe where Florida allowed concealed weapons in bars and if he were at Pulse the night the shooting happened. "You're the first responder, because you're there. The police and the ambulance, they're second responders," he said. "They clean up everything and deal with the aftermath." "A concealed weapons permit is for protection. It does not make you a first responder," Rodriguez said. "If there's a safe option, you get out of there. Your job is to get out of harm's way. And if there only way out of harm's way is to use that weapon you have a license for, so be it." Hendrix said when evil decides to act like it did last year at Pulse, it's just there to do its deed. And he started the Fort Myers chapter of the Pink Pistols to arm people with confidence to stand up to evil and say "it ends here".